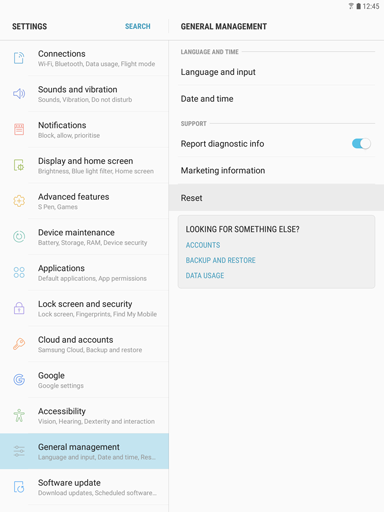 What can I do if my Galaxy Tab S3 is acting up or unresponsive? 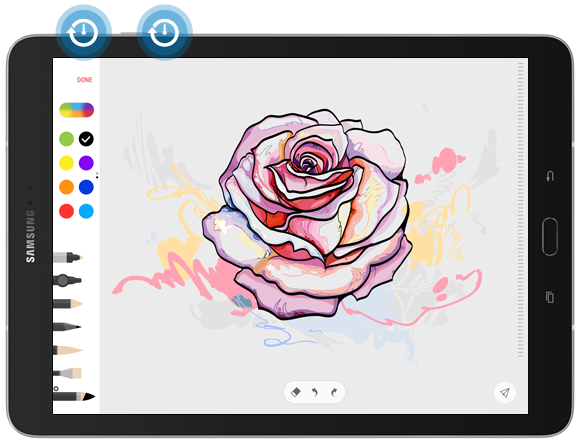 A tablet is like a small computer that fits in your hand and is capable of handling many things for you. Unlike a computer or a laptop, you make sure your mobile device is charged and turned on all the time. Having your mobile device on all the time, on a long run, can have a negative effect on the performance of your device. It may cause glitches, or even worse, unresponsive. 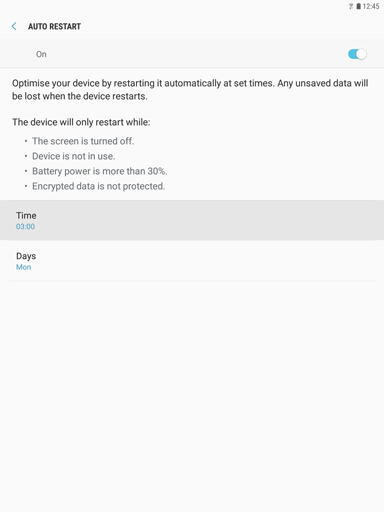 Your tablet offers a few functions to prevent any possible malfunction: use Device maintenance to automatically optimize the performance of your device and Auto restart to restart your device automatically once a week. 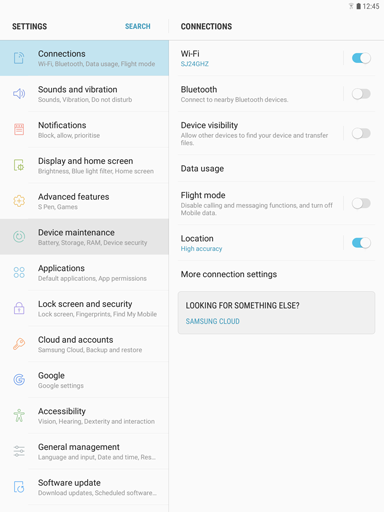 When prevention is not enough, our guide will present you the first solutions you should try to fix any issue you might encounter while using your Samsung device. Please do not hesitate to contact us if your issue is still not resolved. 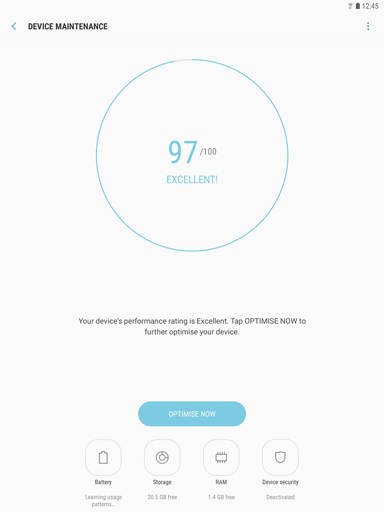 Note: You can automatically optimize the device with a tap of your finger, using the quick optimization feature. 5. When optimization is complete, touch DONE. 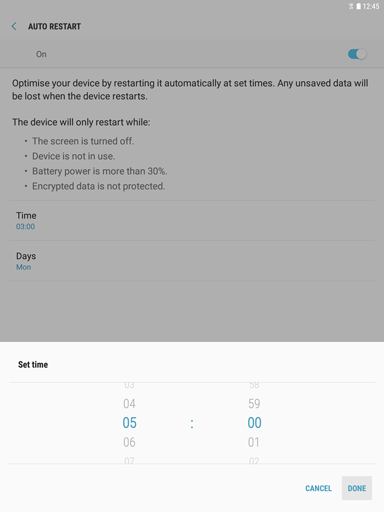 Note: Optimize your device by restarting it automatically at set times. Any unsaved data will be lost when the device restarts. 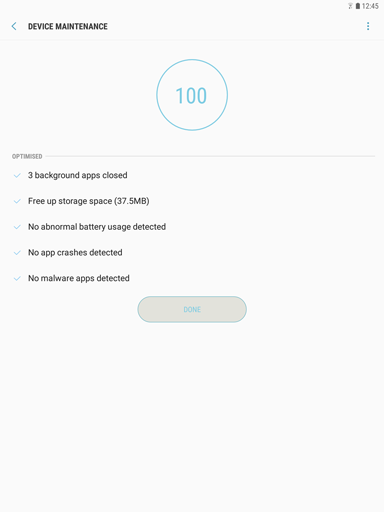 But restarting your mobile device once a week will also free up RAM and allow your device's performance be at its optimal. 3. 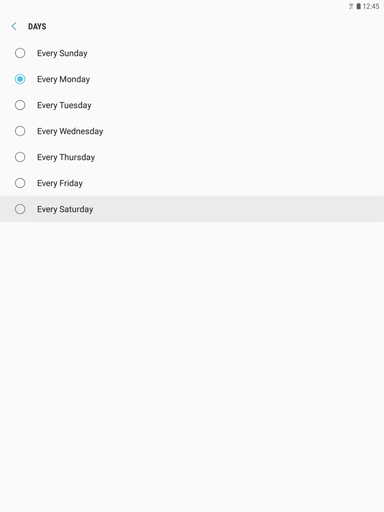 Swipe to and touch General management. 6. Touch the slider to turn Auto restart on . 8. Set a time by swiping your finger up or down. Select AM or PM (if applicable). Then, touch DONE. 10. Select a Day. 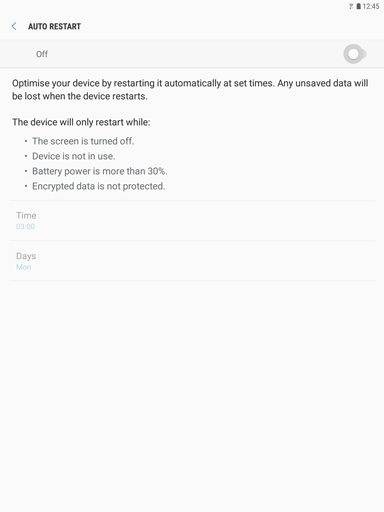 For now, it is possible to restart the device only once a week because this is sufficient for optimal performance. Your device is designed to stay on (in sleep mode or wake mode) all the time. 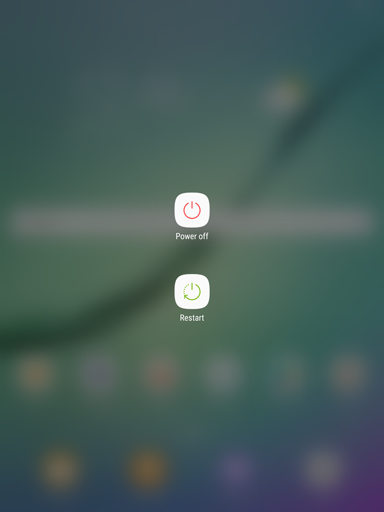 Note: It is, of course, possible to restart your mobile device manually, anytime, using the Power button. Note: If a certain app or feature on your device is not working properly, the first thing you should try is to turn off the app or feature and activate it again. 1. 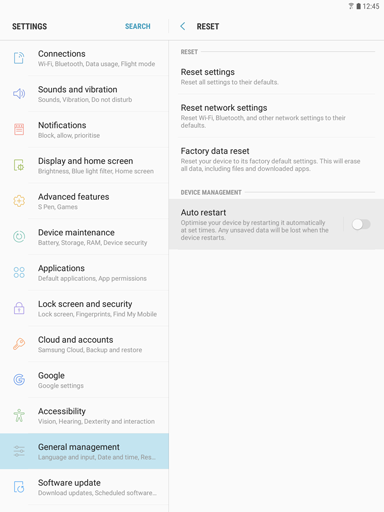 For example, if your device experiences difficulty connecting to your home network, for no apparent reason, touch the slider to turn off Wi-Fi. 2. Then touch the slider again to activate Wi-Fi again. 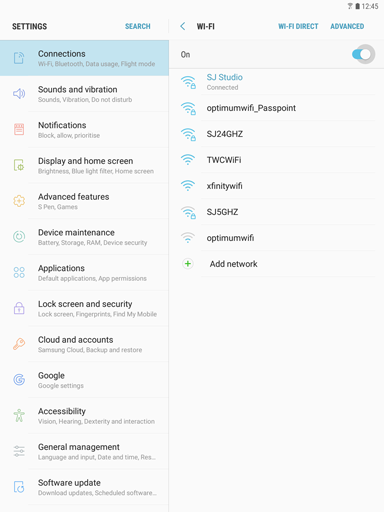 Note: The Wi-Fi feature was used as an example, you can apply the same strategy to any feature. If your mobile device is acting up, simply restart the device. You will be surprised how many issues this simple trick can fix. When your device becomes unresponsive, you can attempt a force restart. Press and hold the Power key and the Volume Down key simultaneously for more than 7 seconds to restart it. 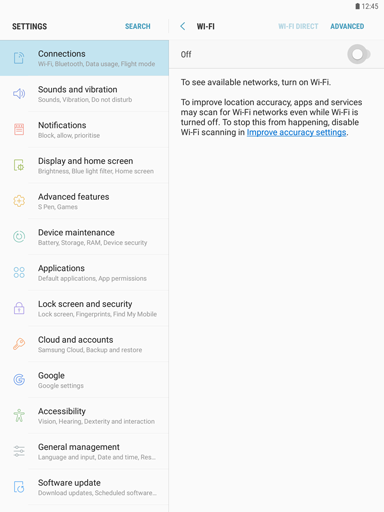 This will turn your device off and back on without affecting any data stored on the device. 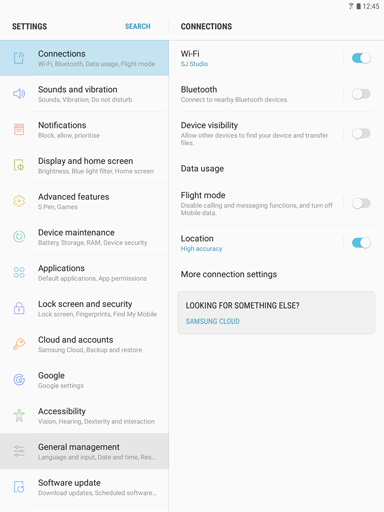 How can I use device maintenance to optimize the performance of my Galaxy Tab S3?